Worship Leaders all over the world are doing a great service for their local church communities. Few things are so important as helping people connect to the Living God. But how do Worship Leaders learn and develop their skills and abilities? And how do they sustain a life of serving others week in/week out, while also trying to remain a disciple of Christ, rooted in His Word and Living in the knowledge of His presence and Kingdom? My name is Stephen Toon, I was a Worship Pastor for almost 20 years, and now I am supporting local churches by mentoring and training worship leaders. I am developing a community platform for Worship Leaders where they can learn, grow, connect, and be personally mentored. It's called Worship Leader Life. 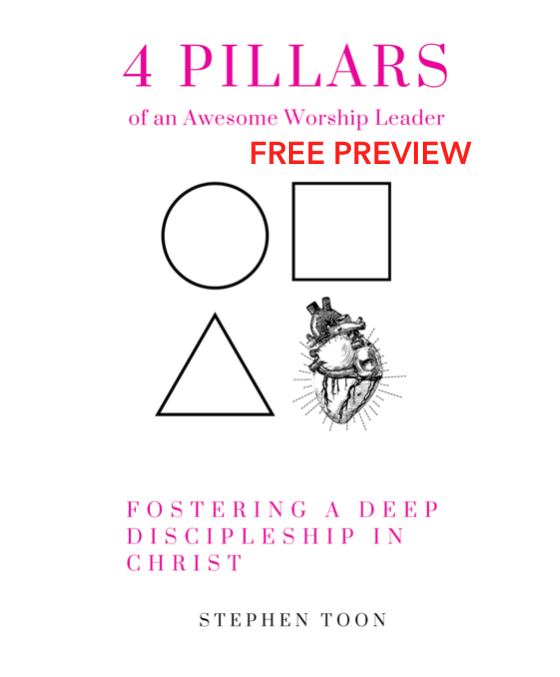 To celebrate the birth of this adventure and to kick things off, I’ve released a mini eBook called 4 Pillars of an Awesome Worship Leader: Fostering a Deep Discipleship in Christ. I’m so excited to share this with you and I can’t wait to roll out some more great content and vision for Worship Leader Life in 2019. RIGHT NOW YOU CAN GET A FREE PREVIEW OF THE BOOK! It's in PDF Format, so you should have no problem viewing it on your phone, computer or tablet. I hope you enjoy! Remember, worship is your life and your life is Christ. Talk to you soon!